The FastPak™ line of packaging solutions is designed to provide scalable options for virtually any medical facility that has a need for packaging unit dose and/or multi-dose orders. 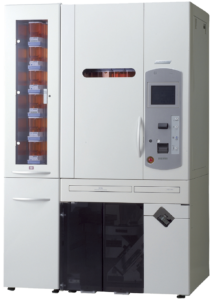 Used primarily for retail, long-term care and hospital pharmacies, the FastPak Elite premium packaging solution offers unparalleled versatility and modular configuration to provide limitless drug formulary capabilities. Featuring 100% smart canisters, which can be placed anywhere in the device, the FastPak Elite enables you to automate up to 100% of your solid oral medication fulfillment. In addition, the dynamic bag sizing function selects the correct pouch size based on contents being packaged, which provides significant savings on consumables. Innovative printing capabilities allow for the inclusion of graphics and specific dosing instructions to help improve adherence. Lastly, the FastPak Elite features half tablet canisters, which automates splitting of pills and tablets, increasing accuracy for half tablet dispensing and saving your pharmacy staff valuable time. FastPak™ Verify is a pouch verification solution designed to work with FastPak automated packaging systems. This tool improves the efficiency of the pharmacy by automating the verification process of packaged oral solids by analyzing the quantity, shape and color of every pill in a package to ensure it matches the expected prescription for a given patient. This compact system is designed to save time on packaging and verification, allowing for growth without adding resources or compromising quality. FastPak Verify also enables an enhanced auditing system, as it captures a visual record of each medication/pouch that it verifies. For pricing details and additional information regarding our Pharmacy Packaging Systems, contact ARxIUM today.